These pullers are ideal for pulling a wide variety of press-fitted parts including bushings, bearings, wheels, gears and pulleys. Grip-O-Matic pullers have been rigorously tested for top performance and reliability. 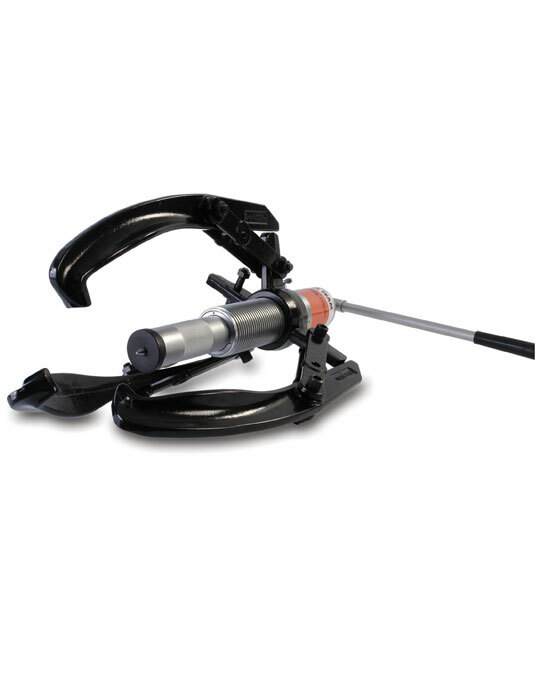 PH82K is a complete pulling system which includes a hydraulic power module, 2-way puller head, jaws, legs and bearing splitter attachment; all contained in a convenient carrying case. You get the world’s most copied puller design; the harder the pulling force, the tighter the jaws grip for secure holding force. Power Team pullers are tested for top performance and reliability at maximum capacity and jaw spread. Removing a wide variety of gears, bearings, bushings, pulleys and other press-fitted parts becomes a routine task. Easily metered release valve control knob. Spring loaded live centering cone. Use with 2 or 3 jaws. Supplied with a sturdy storage/carrying case. Features Power Team’s exclusive Limited Powerthon Lifetime Warranty.